How many pills are in a box (12)? Or is it 1 pill per box and I get 12 boxs? You'll get 1 box with 12 chews in it. do the 12 chewables pills come in individual box packet ? Yes, each chew/pill is packed individually. We buy them in large quantities and get a much better deal than your local vet. Most of the items have around 24 months expiry on them. We only sell new stock. Why does your company not require a veterinary prescription, yet every other place I have found requires a prescription? All products we are selling are over the counter where our company is. Do I need a prescription from my vet. No, no prescription is needed. 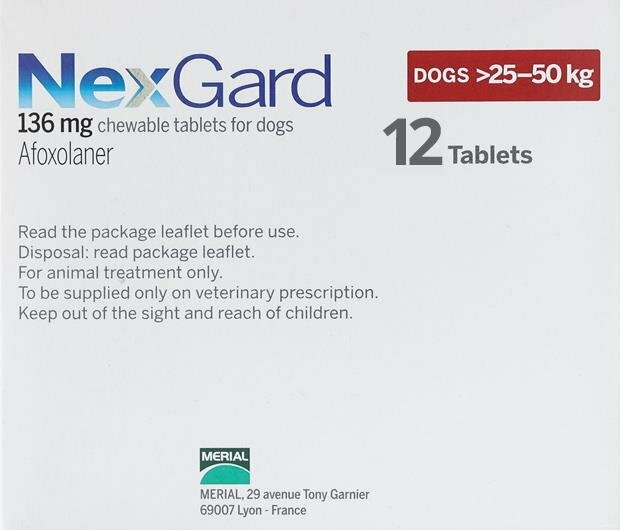 I've found that Nexgard works well for my dogs and three of the four will take the chew as is. The fourth gets hers crumbled and hidden in her soft food. 5 stars! Fleas, and particularly ticks, are a year-round problem where I live. On top of that, I have a rescue Belgian Malinois that had ehrlichia when she came into rescue. Though successfully treated, it is critical that she not get reinfected. Combine that with the sensitivity that some Belgians have to flea/tick treatments and I have to be careful. Nexgard takes care of the ticks and is well tolerated. I can now let her run in the woods and be the wild woman she is. We provide NexGard to all our animals we rescue. Local vet says this is all they need along with heartworm preventative. Low cost really helps as we are a small donor supported rescue in SE Texas. I have two livestock guardian pups, a Pyrenees and an Anatolian shepherd, as well as a grown Pyrenees and two pet dogs (both rescues). I am going to a new veterinarian known for her good service and lower-than-average prices. She recommended this product as superior to the others. Unfortunately it costs a small fortune in the States, and frankly I am fed up with human medicines and pet medicines alike being outrageously overpriced just because we have a runaway health care system run by Big Pharma. I checked prices on this product, which is a prescription-only drug here, on the Internet. Then I called the vet's office to see what the charge was there. Her price is less than other USA outlets, but it was still double the price of Petbucket. Gee, guess which I chose? This is NOT a prescription-only preparation in countries that have sensible laws, and I am not bothered by its coming from Great Britain. It's the same exact stuff as is sold in the USA. I will order this and whatever else I can from overseas not just on the basis of cost but on principle. Profit seems to count more than morality or logic in my country, so I'll find alternatives whenever I can.